On October 13, after 20 hours of travel from Seattle to Austria (by way of London and Munich) I arrived in Salzburg. My very pregnant daughter was there to greet me and my happiness served to keep me upright after missing a night’s sleep. 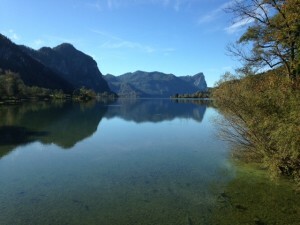 The last 50 minutes of the drive from Salzburg to Mondsee was especially beautiful, as the lake of the same name sparkled and reflected the foothills of the Alps dancing over the water’s surface. While the reflection of the mountains continued to dance on Mondsee Lake, I found myself sitting more, eating more, and wondering how this experience of a lifetime will unfold—my daughter is having a baby miles and miles from home and I am blessed to be here. It seems I ate more bread and cheese and sugar in that first week than I have had in the last three months. Before I knew it, I had been extremely inactive for days. There were a few walks by the lake, but truly; it didn’t take long to notice that my body, mind, and emotions were thrown off center. Sleep was erratic and my stomach was talking to me, and not in a very pleasant way. I was filled with so much anticipation, so much excitement and wondering, and I was in a place where I only understand a very few words of the language. On day eight, I finally pulled out my laptop and inserted a Nia DVD. I opened the door of the sweet guesthouse where I am staying, looked out to the mountains and lake, and began to dance. Oh, and I mean, I began to dance! My body was so happy to do a simple spinal roll and OMG—the thrill of raising my arms above my head made me grin! I remembered the Joy of Nia and it spoke to me from every cell in my body. I remembered why I love it so much and why it has been an essential practice in my life for close to 20 years. Gentle tears rolled down my face after the first minute of movement. I was home again, home in my body, even though I was in a far off land. I had finally returned to the memory of wholeness. I came back to my center. And I have felt so at home here in Austria every since. It has been, as they say here, “wunderbar”! What brings you back home to your body? Please give yourself that gift soon. You deserve it. And the memory of wholeness will bring you delight—guaranteed! This entry was posted in Uncategorized on October 25, 2014 by Susan Tate. Thank you Susan for this beautiful reminder. I have recently stumbled upon this place, well that Sommer and I spoke to great lengths about, called THE SWAMP. We all have one, but ya know, the great thing is that we DON’T have to live there. By literally moving we are choosing to step out of the sludge and into the flow of a raging stream that fills our cup of life and reminds us of why we are here. Not just to live, not to stay in the swamp, but to THRIVE. Our choice can be simple, not complex, not talked to death or labored upon. Just Move, and the awakening unfolds with the joy -filled light of all that is. Blessings to you and All.